Is Spring really here? I think it's trying . . . we're supposed to be in the 70's today here in Texas and over the weekend -- my kind of weather! 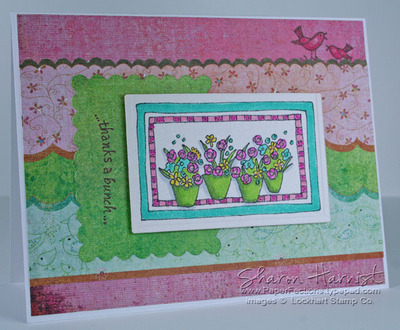 I wanted to celebrate with this beautiful bunch of 4 Flower Pots by Karen Lockhart. And check out those darling Itty Bitty Birds in the upper right corner -- aren't they sweet? 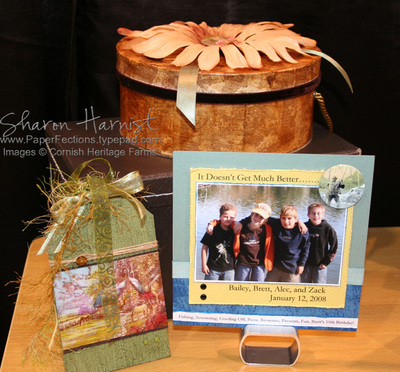 The image was cut with Spellbinders Nestabilities Classic Rectangles and popped up on foam tape. The green square of paper was cut with Nestabilities Scalloped Rectangles. 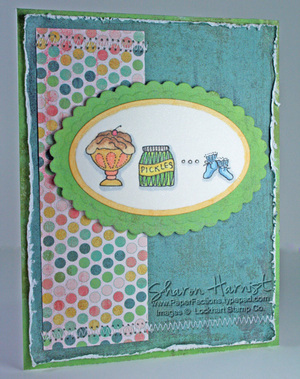 Pheobe patterned paper by BasicGrey was trimmed along the scalloped top with decorative scissors, to match the pattern. 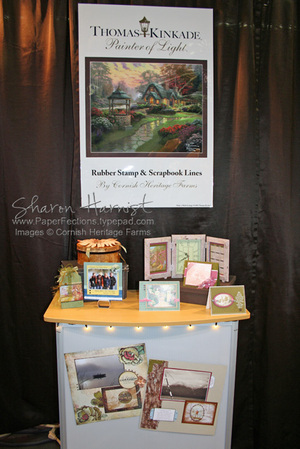 Card base is Papertrey Ink's Stamper's Select White. My favorite Lockhart sentiment, Thanks A Bunch, finishes off this card. Be sure to check out the blogs of these fabulous stampers to see their take on this week's sketch: Beate, Cambria Turnbow, Charmaine Ikach, Jenn Balcer, Laurie Schmidlin, Lori Craig and MaryJo Albright. I think Spring is reason enough to celebrate, but do you see that site meter counter over on the right sidebar of my blog (at the top)? It's going to hit 300,000 visits today, thanks to you sweet people! So I'll be back with a weekend giveaway for you in a bit . . . you won't want to miss it! Ice Cream and Pickles anyone? If so, I hate to be the one telling you this . . . one of these cards just may be in your future, too! 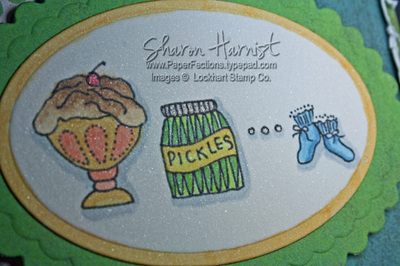 I love Karen Lockhart's sense of humor with her style of stamps -- so unique! My 2nd grader's teacher is due in March with her first child, a boy, so I thought I would get ahead of the game (for once!) 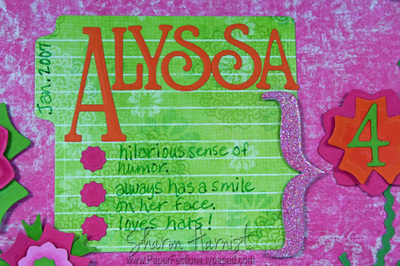 and have this baby card all ready for her. I used CPS#53 for the layout and BasicGrey's new Two Scoops 6" paper pad -- I thought these colors would be good for a baby boy. I colored around the embossed edge of the Spellbinders Nestabilities Classic Oval with Copic marker #YR31, which gave the image the appearance of being double matted. Then the image was matted with the Classic Scalloped Oval Nestabilities, using more of the BasicGrey paper. The image is popped up on foam tape. White machine zig-zag stitching accents the top of the dotted strip of paper and also the bottom, extending the width of the card. 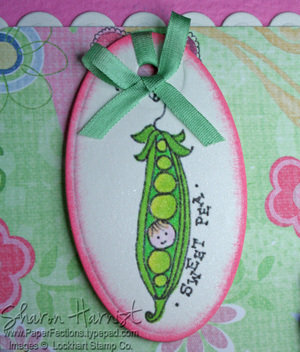 Stay tuned for the second part of this baby gift, coming next month! I generally make cards in landscape format -- don't know why that is other than it's a little more pleasing to my eye and I like that size of canvas. So I flipped this week's sketch and when I did, the element in the lower right of the sketch looked like a postage stamp placement to me, so that's how this card got started! I enhanced this little scene by cutting a cloud mask from Eclipse Tape and airbrushing Copic Sketch marker #B00-Frost Blue for the sky. The postage stamp was cut with Spellbinders Nestabilities Classic Rectangles and matted with a Nestabilities Scalloped Rectangle. 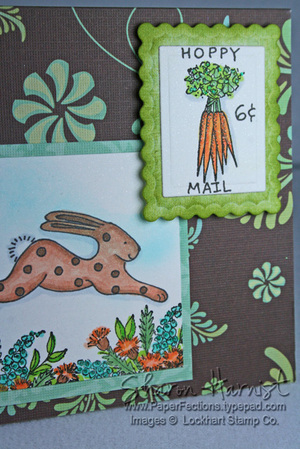 I wrote "Hoppy Mail - 6 C" (the cent mark in this case stands for carrots!!) with black Copic Multiliner 0.3. 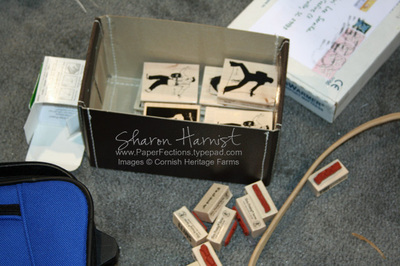 Did you know this is the professional grade marker that Karen Lockhart uses to draw her images? Interesting little fact! The stamp is popped up on foam dimensionals. A row of Fresh Grass Dew Drops in the upper left of this card finishes it off. Be sure to check out the blogs of these talented ladies to see what they've created for this week's sketch! Beate, Cambria Turnbow, Charmaine Ikach, Jenn Balcer, Laurie Schmidlin, Lori Craig and MaryJo Albright. Have a great weekend -- I hope to get some more stamping done and post something else this weekend before celebrating my birthday on Sunday. It's a significant birthday for me and I'm not too sure I'm looking forward to it! 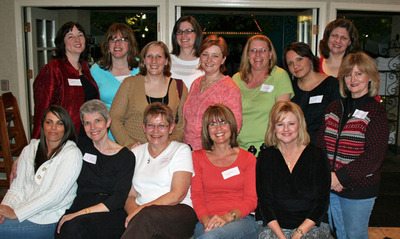 L-R Back: Jami Sibley, Natasha Trupp, Jen del Muro, Sherrie Siemens, Trudee Sauer, Jeanne Streiff, Jenn Balcer, Debbie Olson, Linda Duke. 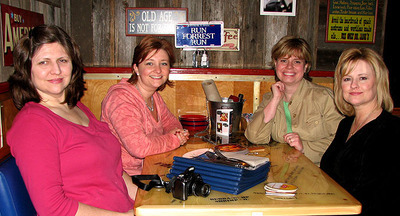 L-R Seated: Lisa Johnson, Kittie Caracciolo, Sherry Cheever, Valerie Stangle, Me. Several others were in attendance but had previous commitments that night and/or missed this photo: Ellen Hutson, Anna Wight, Taylor Van Bruggen (hope I didn't forget anyone!). What a fun time we all had! I stamped them with Brilliance Pearlescent Chocolate on Curious Iridescent Poison Ivory cardstock, colored them with Copic markers, and cut them out. The 6-inch base is Prismatics Intense Kiwi (seems to be my favorite color right now!) I used this week's CPS Sketch #52 for my layout. 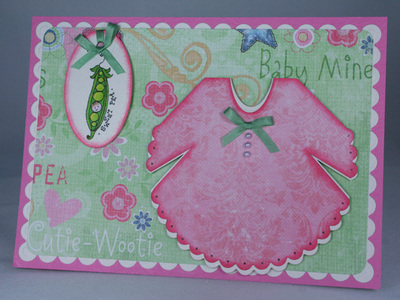 The patterned paper is from BasicGrey's Oh Baby Girl (I believe) and the pink & green flowers really said Spring to me. The edges of the paper were distressed with Tonic's Edge Distresser and inked with Tea Dye Distress Ink by Ranger. 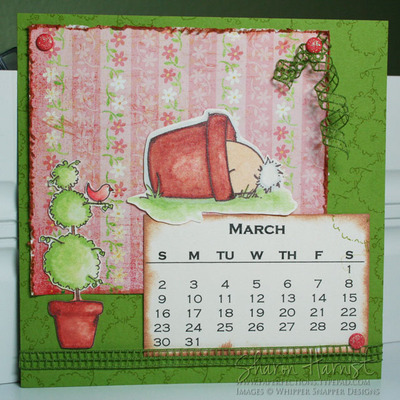 I created the calendar myself and printed it onto Poison Ivory cardstock. 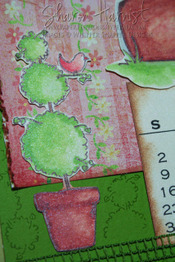 I stamped the Topiary with Ranger's Lettuce Adirondack ink on the green background. 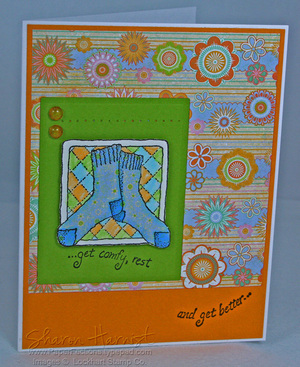 The page is finished with sparkly Sugar Coated Brads (pastel assortment) by Doodlebug. I colored them with the same pink Copic marker I used for the little bird in the topiary. Green grid trim is by Creative Impressions. 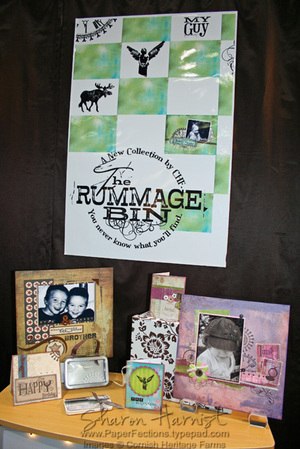 You can check out all the other creations for this challenge by visiting this gallery. 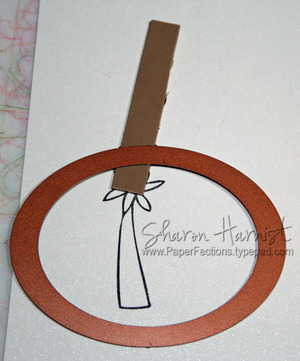 Here are the instructions for the out-of-the-box technique I created on this card. 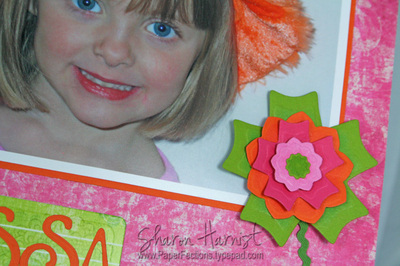 Start by stamping your image on cardstock, then position the die of your choice over the image (cutting side down). 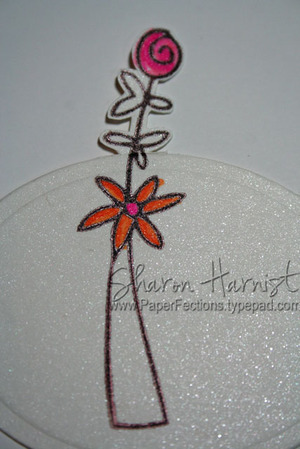 Where you DON'T want the die to cut, slip a piece of the Spellbinders Tan Embossing Mat under the die. Trust me, the die won't cut into that mat -- how cool is that?!! 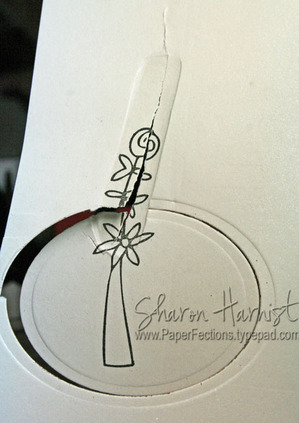 Tape the die & mat in place with scotch tape (preferably removable). I try not to tape into the image area, just in case the tape doesn't remove properly. Then FLIP YOUR IMAGE AND DIE OVER, so the die is now facing up and run thru your Wizard machine, using the normal cutting sandwich. A real slap your head moment, huh?!! 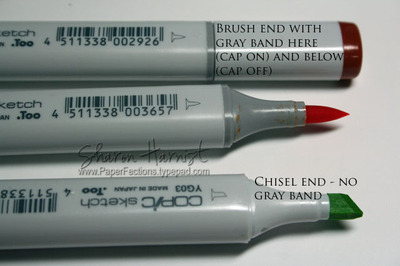 The gray band indicates the brush end of the marker, so you don't have to keep flipping the marker over, looking for the brush end indicator! The chisel end does not have a gray band. 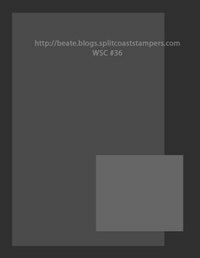 I hope these Copic tips help you out and you try the out-of-the-box technique with your Spellbinder dies -- I think you'll enjoy it! 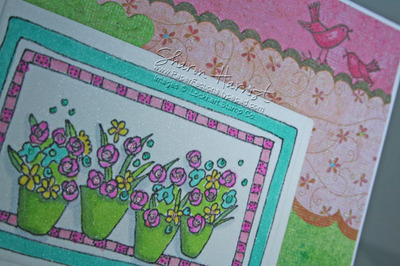 While I had those same BasicGrey Gypsy papers out on my desk for yesterday's sketch challenge card, I ran across Tami Mayberry's blog that had a color challenge on it (hosted by Julia Stainton), using just about these same colors, so I thought I'd play along! A few of the Cornish Heritage Farms designers (you'll find their blog links in my left sidebar) that were unable to travel to CHA got together this week and entertained themselves with daily challenges -- how fun! So since I only got to go to CHA for one day, I thought I'd play along, even though I didn't discover these challenges until yesterday! I didn't have those exact colors (yet! 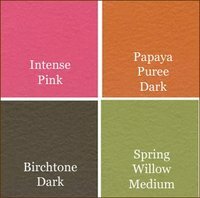 ), so I substituted Prismatics Intense Orange for the Papaya Puree Dark and Intense Kiwi for the Spring Willow Medium (hope that's okay!). My Intense Pink and Birchtone colors are picked up in the vase of flowers and Primas. 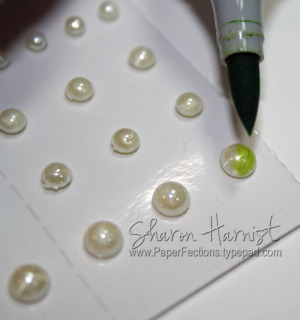 To get the perfect color of pearl for the Prima flower center, I just colored a white pearl with the green Copic marker I used to color my main image! 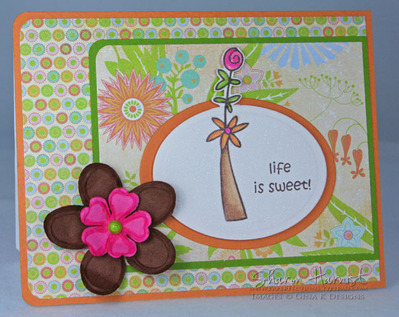 The sweet flower image is Gina K's new Stamps for a Cause set, How Sweet It Is. Gina is the kindest soul and I've really enjoyed working with her last year and this year on her Stamps for a Cause Campaign (<== you can read all about it by clicking on that highlighted text). $7 from each stamp set benefits The American Diabetes Association and the Juvenille Diabetes Foundation. I'll have a tutorial in my next post about how I created this out-of-the-box flower and a few more Copic tips, so watch for that a little later today. Edited to add: The tutorial is located HERE. Why don't you have a little weekend fun, too, and join in the challenge . 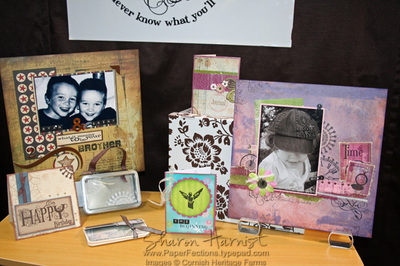 . . you can post a link to your creation either on Tami's blog or here and I'll come check it out! I darkened the toes, heels & tops of the socks with the blue Copic marker mentioned above. The Lockhart sentiment (which it appears Ellen is sold out of at the moment but check back -- these are usually replenished pretty quickly) was partially inked and split up on the cardfront. The sock image is mounted on dimensionals to a piece of Prismatics Intense Kiwi that was cut with Spellbinders Nestabilities Classic Rectangles. Something I love about the textured Prism cardstock is that the edges flatten out when embossed with the Nestabilities -- gives a cool two-textured effect on the one piece of cardstock! Two Plumeria Dew Drops accent the piercing I did across the top of the green panel. A panel of Prismataics Intense Orange was adhered to a PaperTrey Ink Stamper's Select white card base and another pattern from Gypsy tops that. 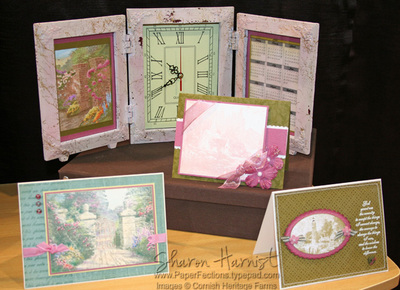 Be sure to check out more samples made for Beate's sketch on the blogs of these fabulous crafters: Beate, Cambria Turnbow, Charmaine Ikach, Jenn Balcer, Laurie Schmidlin, and Lori Craig. Have a wonderful weekend . . . 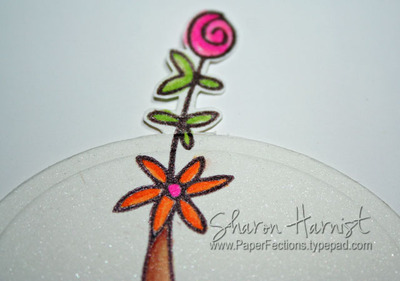 I plan on doing some more stamping and may even get together another Copic tutorial for you! I've also updated the two CHA project posts below with more photos. The bracket is also a Spellbinders die -- I cut one from thin chipboard and another from pink cardstock, glued them together and then glittered the pink top. Flower stems are green baby rick-rack. The number 4 indicates my sweet youngest daughter's age in the photo last winter. She loves to wear hats and this fuzzy orange one she picked out totally fits her personality! The photo is 5" x 7" and is matted in orange cardstock. 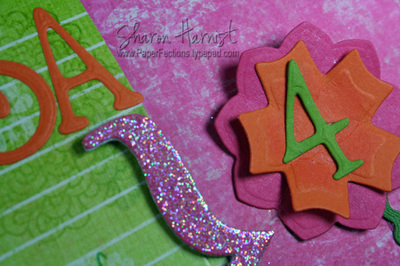 Spellbinders dies: Flower Creations 2 & 3, Indulgence Upper Alphabet, Julius Alphabet & Numbers, Brackets, Filing Folders. Paper: Key Lime printed papers (Delightful & Heavenly patterns) & Creative Cards Notecard Journaling block by Fancy Pants, Prismatics solid textured cardstock (Intense Orange, Pink & Kiwi; Razzleberry Light) by Prism. Accessories: Creative Impressions rick-rack, I-kan-dee Pearlescent chalks by Pebbles Inc, Olive Spica glitter pen by Copic for journaling, Stampin' Up ultra-fine transparent glitter, Quickie Glue Pen by Sakura, thin chipboard. WOWZIE congrates on your 1 year ANNIVERSARY .. I have yet to try the copic markers and what a thrill it would be to win .. and Love that stamp set too . Congratulations, Dawn! I've emailed you for your mailing address. Thanks to everyone who stopped by (and there were a lot of you who stopped by every day) -- I greatly appreciate your support and continued encouragement! 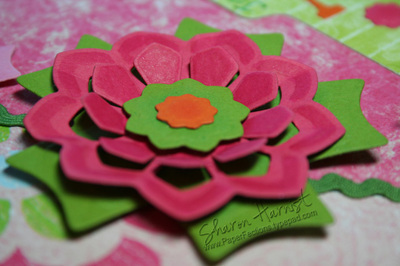 I'll be back a little later on Thursday than I thought to post those Spellbinder projects I did for CHA . . . I guess these meds I'm on for the blood clot are zapping my energy by the end of the day, so please bear with me while I adjust. 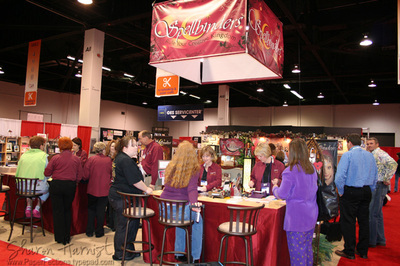 When I told you all about the new Xcalibur machine from Spellbinders and said it is "motorized", I failed to let you know that electricity is what will motorize it! Thanks to you all that pointed that out. 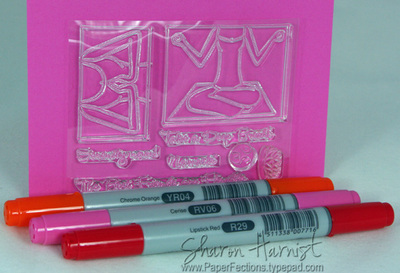 I also wanted to share a brand new set of dies with you -- the new Megabilities Rectangles in both Classic & Scallops! The longest dimension on these is about 6.25" and will be available in about 6 weeks. 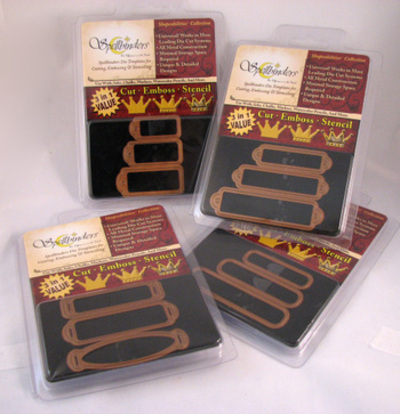 Oh, the possibilities are just flying thru my head -- I can't wait to get my hands on these! Be sure to enter my last day of blog anniversary giveaways, a few posts below here -- the drawing will be later this afternoon. 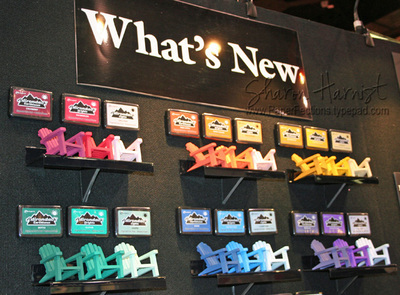 What's new with Ranger Industries -- pigment ink in these 18 colors! The rep said there were no immediate plans to add more colors. 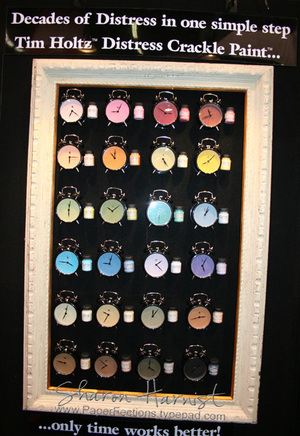 I loved the display of Tim Holtz's new Crackle Paint -- the vintage clock faces were painted with the different colors of crackle paint! 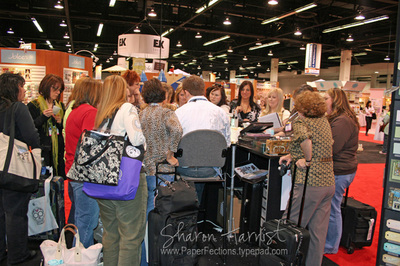 I never got a chance to see what he was demonstrating, because of all the women flocked around him! 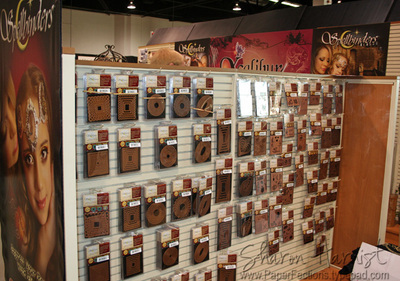 Check back tomorrow, when I'll be able to post the samples I made for the Spellbinders booth! Elvis is out of the box (and lying on the show floor at CHA) -- sorry, I couldn't resist!! 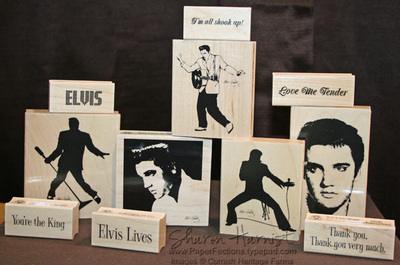 I love the sentiments -- I'm all shook up! ; Love Me Tender; You're the King; Elvis Lives; Thank you, Thank you very much!! The ELVIS one is in tiny light bulbs (hard to see in photo). Wonderful images, aren't they? I'm not sure when these will be available for purchase, but I'll update that information when I find out. 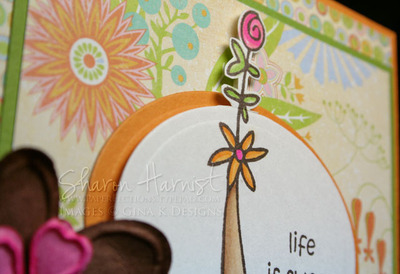 Above are samples from Kim Hughes' line of fresh, funky and also elegant stamps. It was a great pleasure to finally meet Kim there in person . . . such a sweet soul! Can you believe it? 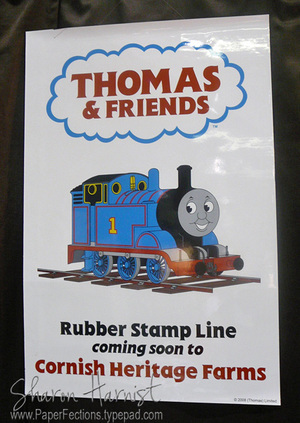 You'll be seeing Thomas and some additional licensed characters you all know and love coming to CHF soon! News still to come from CHA on Ranger . . . 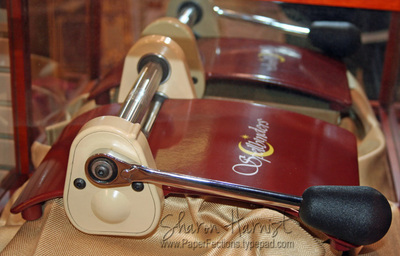 Direct from CHA, here's the first view of the Spellbinders new motorized die cutting & embossing machine -- Xcalibur! 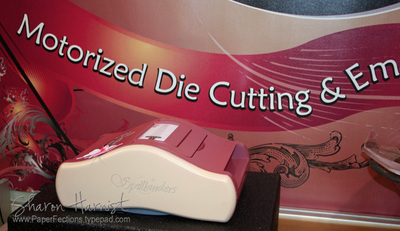 It's whisper quiet and you'll still have the option of either just die cutting, just embossing, or both, with two different passes thru the machine. And are you ready for this? Drum roll, please . . . the price point will be around $129 (subject to change) and should be available around May this year (summer'ish)!! It will be the machine to go to when you want to craft late at night, in silence (how many of us do that -- I know I do!! ), have a lot of projects that need to be cranked out quickly, and easy to operate/no stress on the hands/wrists for those with carpotunnel or if you need to be using your other hand for something else (like feeding the baby or talking on the phone)!! A little bit of a redesign, to help with proper mat placement, and beautiful new colors! 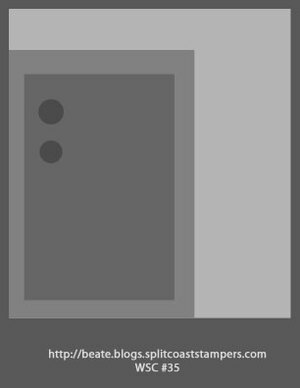 (This machine was a prototype and will be a little more mauve in color, to match the Xcalibur's color). 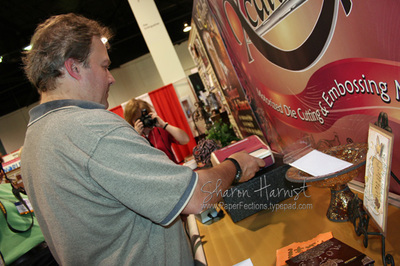 Jeff Caron (Spellbinders owner) test drives the Xcalibur for us for the first time Saturday night after the booth is almost set up. Jeff is the engineering master-mind behind the Spellbinders machines and dies -- his background was 20-something years in the aerospace engineering industry before starting the company with wife, Stacey. Dies, dies and more dies! These were primarily the Nestabilities. There were 4 large displays like this one, full of dies! Check back in . . . I'll have some more CHA updates coming and I'll be able to share the samples I made for Spellbinders on Thursday, after the show ends. Don't forget to enter my last day of blog anniversary giveaways, in the post directly below this one. Here's the 7th and final giveaway in my 1-year blog anniversary celebration . 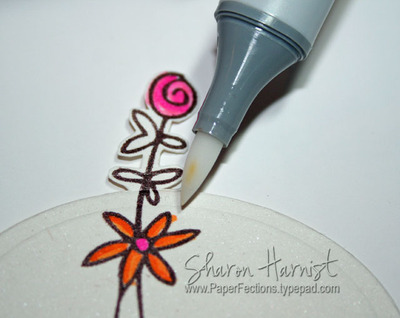 . . how about some Copic markers and My Favorite Things stamps?!! The Copics are Ciao YR04-Chrome Orange, RV06-Cerise, and R29-Lipstick Red. 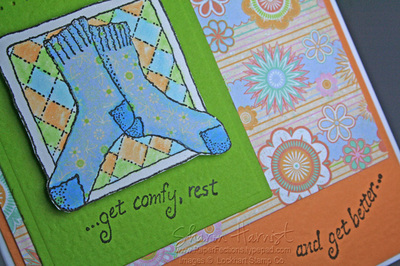 The MFT stamp set is the current mini Set of the Month (February) -- Serenity Now! To be entered in the drawing for this giveaway, just leave a comment directly below in this post (one per person, please). Since I'm later than I wanted to be getting this post up, I'll leave the comments open until 2pm CST tomorrow (Wed) and draw a winner tomorrow afternoon. Good Luck! I'll also try to be back a little later with some photos from my quick trip to CHA (Craft & Hobby Association) this weekend in Anaheim, CA, so check back in!